Aim: Creating a forum for companies in the area of electronic media at the Book Fair, integration of electronic media into the whole Book Fair. Measures: Visitor and exhibitor analysis, exhibitor and visitor interviews, carrying out interviews and evaluations; analysis and evaluation of national and international fairs with common topics; canvassing of new exhibitors, organisation of German and foreign community stands; staging themed events in the Electronic Media Center. 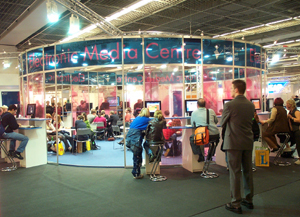 Result: Electronic media are an integral component of the Frankfurt Book Fair and present on many booths today.